It's a Scrappy World: 2-25 New Challenge at Catch the Bug! Today we have a new challenge at Catch the Bug with Bugaboo Stamps! It's a recipe challenge, and we want you to use Lace, Hearts, and Pearls! 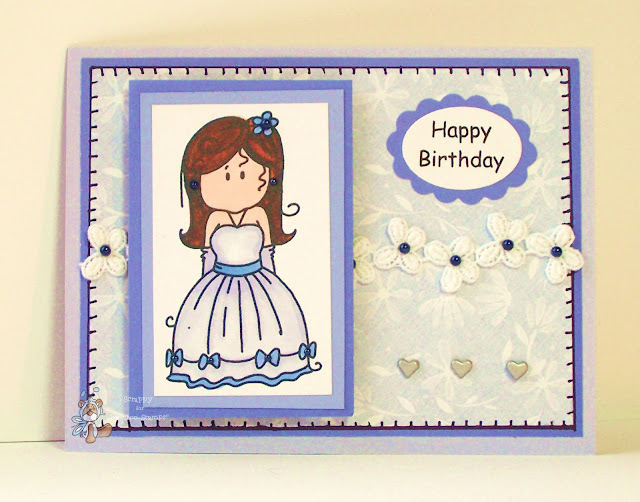 I hope you will be inspired by sample card below featuring Bugaboo Stamps Bugaboo Brats - Pretty Dress. Link up your own creations HERE for a chance to win an uber cool digi prize packet!! We look forward to seeing what you make! Cute card, Scrappy. I love that lace! This is so pretty! I love that daisy chain lace and fab blue colour combo! Thanks for playing along with us in the Fancy or Lacy challenge at Little Miss Muffet Stamps! Great card thanks for joining us at S J Crafts this month. p.s you got last months challenge listed luckly your card will fit into this months theme of flowers. Very pretty card with lovely trim detail. Thank you for joining us at Colour Create. Very cute, love the blanket stitching. This is a lovely card. Our challenge this month is actually Flowers and use red or pink!! Still a great card though!! Very sweet card, the image is adorable! Lovely Card - thank you for joining us at Sarah Hurley Challenges! I hope you had fun with the challenge at S J Crafts.